You are here: Home / Investors / Stock Analysts / C.H. Robinson Rallies 37% in a Year: What’s Behind the Rally? C.H. Robinson Rallies 37% in a Year: What’s Behind the Rally? Despite high costs, shares of C.H. 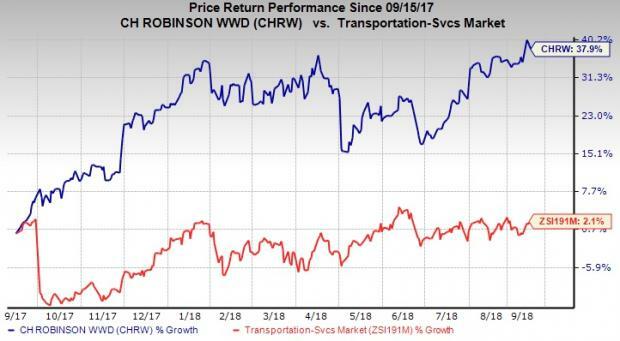 Robinson Worldwide, Inc. CHRW have gained 37.9% in a year’s time compared with the industry’s rise of 2.1%. In July, the Minnesota-based third-party logistics company reported better-than-expected earnings per share (EPS) in the second quarter of 2018. EPS of $1.13 surpassed the Zacks Consensus Estimate of $1.06 and the bottom line improved 44.9% year over year. Results were aided by a lower effective tax rate which was lowered to 25.6% in the quarter from 35.6% a year ago. In fact, the company has an impressive surprise history. It beat earnings estimates in each of the trailing four quarters, with an average beat of 7.2%. Moreover, we are impressed by C.H. Robinson’s presentation at the 7th Annual Intellisight Conference in August, where the company provided an update about long-term growth prospects. The company projects NAST and Robinson Fresh revenues to increase in the range of 5-10% and 4-8% in the long term, respectively. Global Forwarding and other (including Managed Services, European Surface Transportation and all other services) revenues are anticipated to grow more than 10% each. Also, EPS is predicted to rise more than 10% in the long term. Furthermore, we are optimistic about C.H. Robinson’s efforts to reward shareholders in the form of dividends and share buybacks. In December 2017, the board of directors declared a 2.2% hike in its quarterly cash dividend to 46 cents per share (or $1.84 annually). In a bid to promote its buyback program, the company added another 15 million shares to the existing share repurchase authorization of 1.2 million shares (approved in 2013) in May. C.H. Robinson has returned more than $2.8 billion to shareholders through dividends and share repurchases over the past five years. Additionally, improvement in operating ratio (operating expenses as a percentage of net revenues) is a positive. The improvement indicates that more cash is available for rewarding shareholders through dividends/buybacks. In the second quarter of 2018, the metric came in at 67.4% compared with 68.3% in the prior-year quarter. We are also impressed by the company’s grow-by-acquisition policy. C.H. Robinson carries a Zacks Rank #3 (Hold). A few better-ranked stocks in the broader Transportation Sector are SkyWest, Inc. SKYW, Triton International Limited TRTN and Old Dominion Freight Line, Inc. ODFL. While Triton International carries a Zacks Rank #2 (Buy), SkyWest and Old Dominion sport a Zacks Rank #1 (Strong Buy). You can see the complete list of today’s Zacks #1 Rank stocks here. Shares of SkyWest, Triton International and Old Dominion have gained 4.8%, 20.9% and 13.1% in the past six months, respectively.